My partner is a classic bus enthusiast ( or bus nerd, as I kindly call him). It’s his birthday this week and this is for him. The bus stamp (Penny Black) is a new one, but the animals waiting to get on are from old acrylic sheets. Make My Monday Men and boys themne - birds or animals. I started making this yesterday but was unable to complete it due to a horrific burn on the end of my thumb, caused by a hot pan handle . (Pans are being evicted ...surely the handles should be heat proof!!??!!) I had my thumb in a glass of water for three hours - I was going around, carrying the glass of water with me - not ideal for crafting! 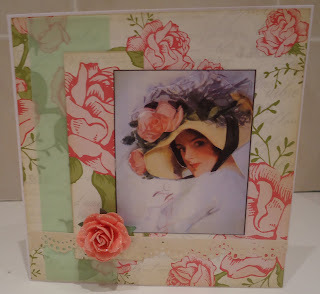 The image is from Joanna Sheen Fashion Boutique CD - I decoupaged the bonnet and then the rose. 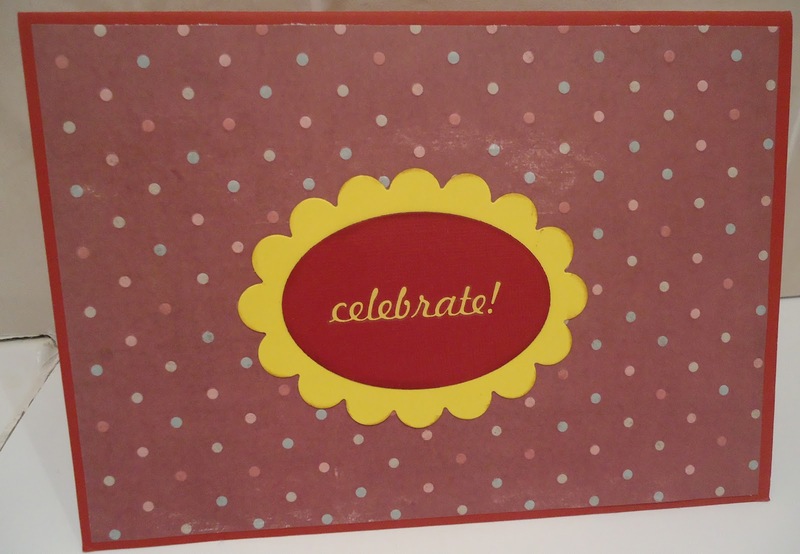 The patterned paper is Echo Park and I also used a scrap of vellum, a Martha Stewart punch to make the 'lace' , and a Prima rose. Hi everybody! Just had fun making this card - was trying to get the feel of an elegant cruise liner in the 1920s/30s. 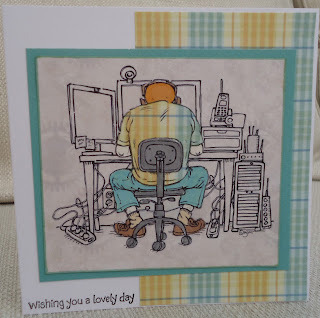 The stamp is called 'Backward Glance' - don't know the manufacturer. 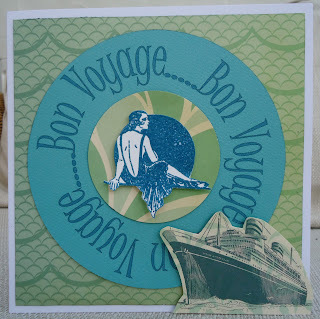 I embossed it in Blue Pearl EP. 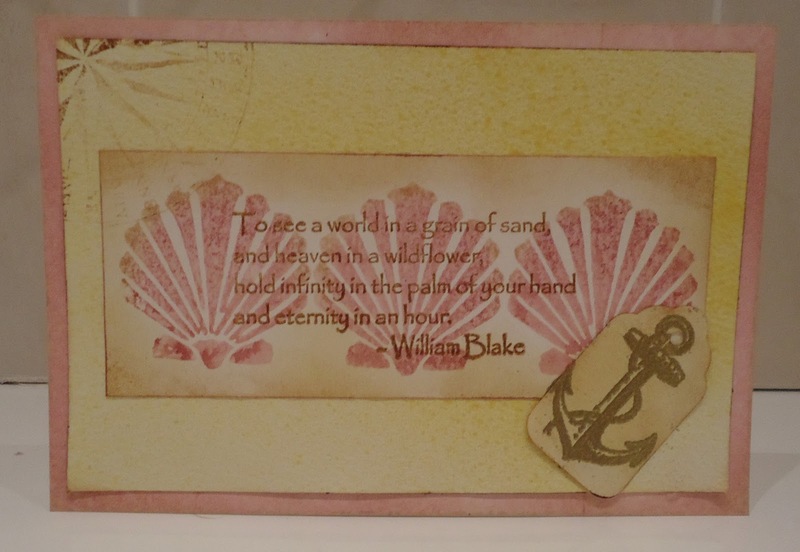 The two papers are from the Cosmo Cricket Salt Air collection and I cut the liner out from this same set. I made the circle of words on my PC and printed it onto coloured cardstock - cs is a paler aqua green in real life. Papertake Weekly Water, water everywhere. 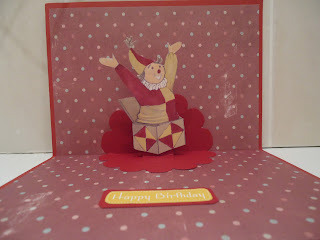 I've really enjoyed making this card...it's taken me all evening (incorporating watching The Voice UK while doing it). 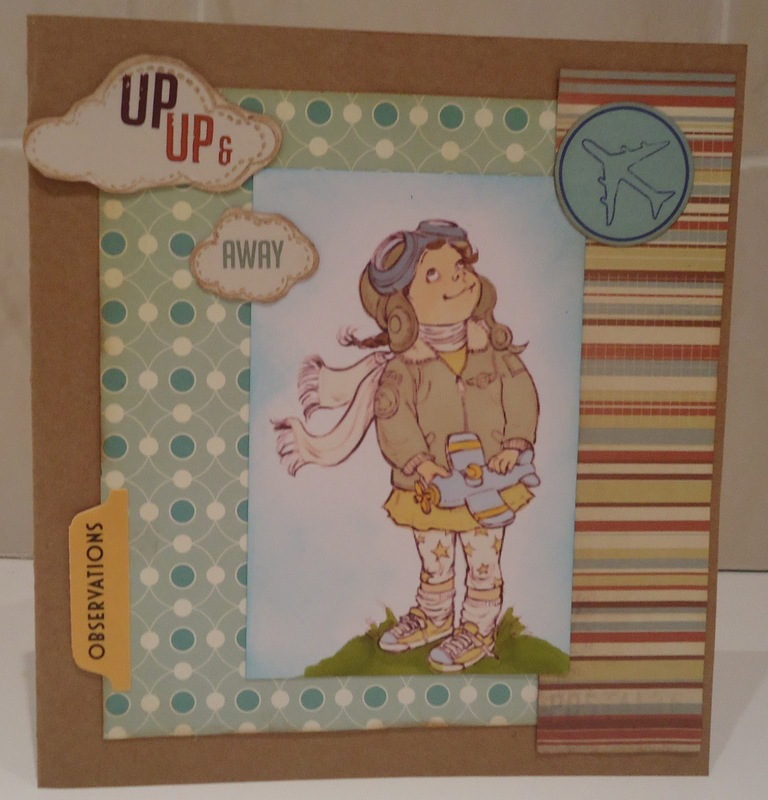 I was supposed to be going out but the babysitting didn't work out.....so I've thrown myself into cardmaking. The shop sign and flower are all from Marianne dies. The owl is an acrylic stamp, origin unknown. The patterned paper is Basic Grey. Okay..I know it's spring but I love these autumn colours. Gingersnap Creations copper, ginger or rust. 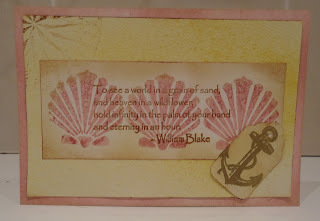 I wanted to make a nautical theme card...but this one looks more sandy than sea! 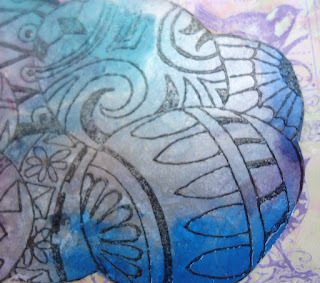 The stamp is a single shell silhouette by Inca. 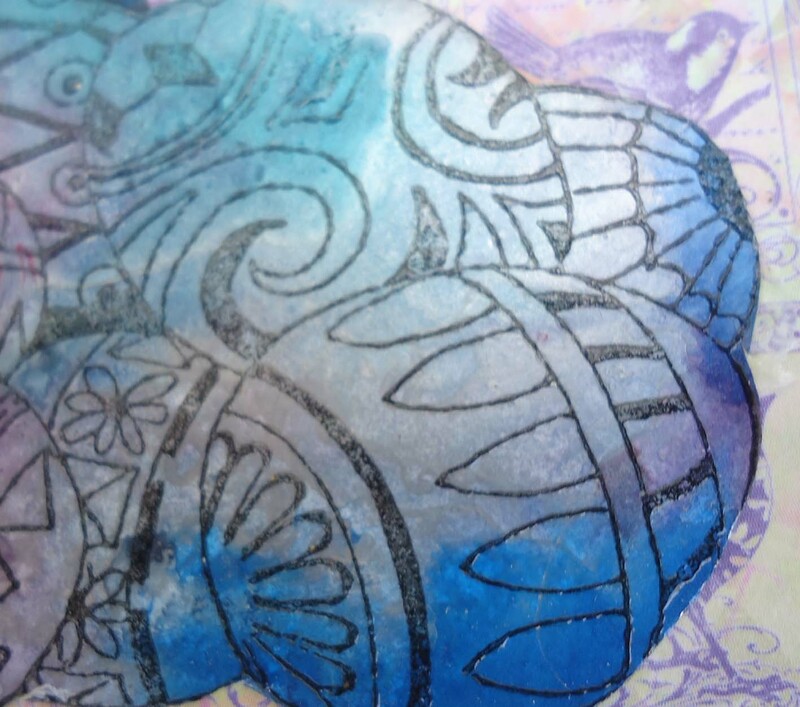 I inked the stamp with distress inks - Victorian Velvet with Antique Linen on the tips, sprayed it with water and stamped onto watercolour paper (repeated 3 times! ) The sentiment is a red rubber Um - probably from a Non-Sequitur plate. The compass and anchor are Kanban. 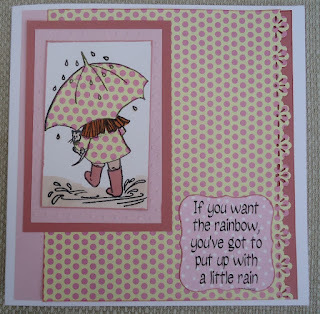 The backgrounds are Distress Inks and Glimmer Mist. For this project (ooh! !- not just a card, my friends!) - I was trying to get an effect like those Victorian bell jars. (Can you see the domed acetate?) 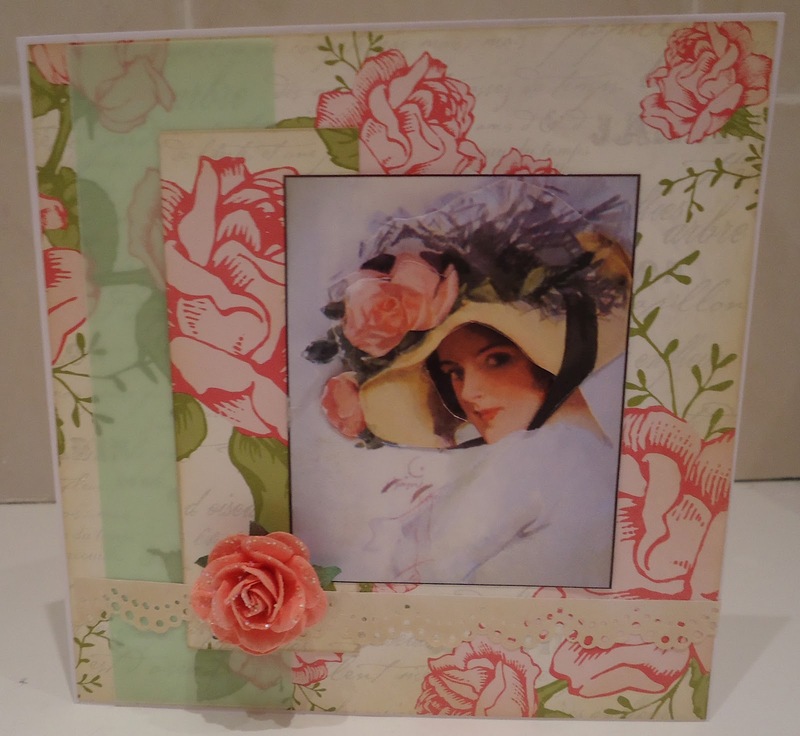 I don't think I've really achieved that - this is too light for a Victorian, I think- but I quite like it anyway. Maybe I'll have another go at the bell jar look. 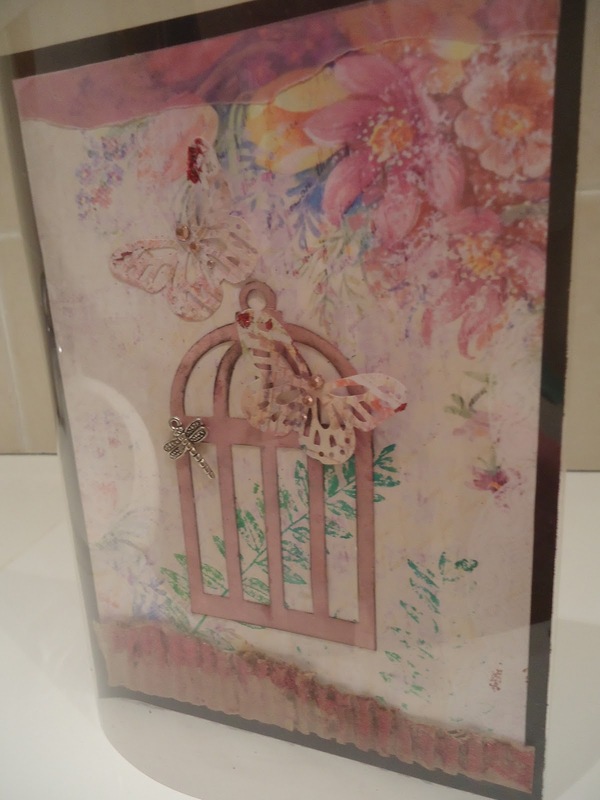 Die cut cage from MCS coloured with Victorian Velvet Distress ink pad, Glimmer Mist and black ink pad. Acetate to make a dome. 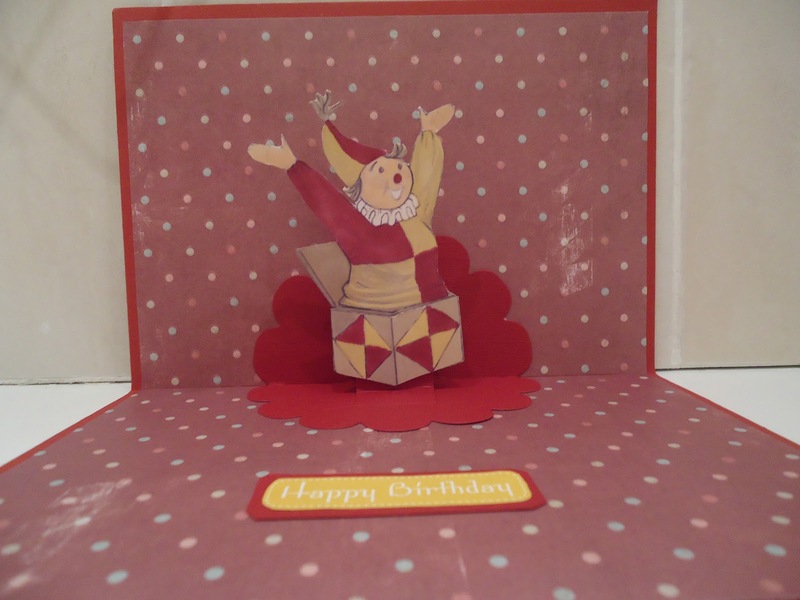 Jack in a Box - pop up! 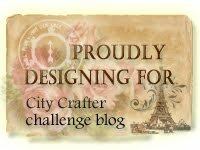 Although I now have lots of CDs, I’m not much of a CD crafter, and this project reminded me of the things I like about CDs and the things I find ‘challenging’. 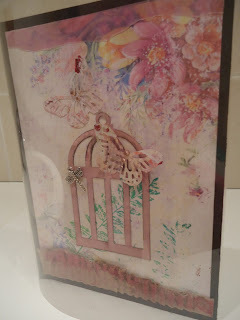 I wanted to take part in the CD Sunday challenge –Toybox Treasures – and felt sure I’d find something good on the Adorables Summer Collection CD. I did but it was part of a whole page of different images and I didn’t want to use them as they came. 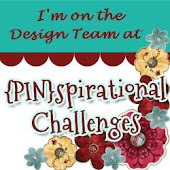 I took the Jack-in –a –box image into My Craft Studio and digitally punched it out but I still couldn’t change it to colours I wanted – or to a black and white digi stamp. In the end I printed it in grayscale and coloured it in over the top! 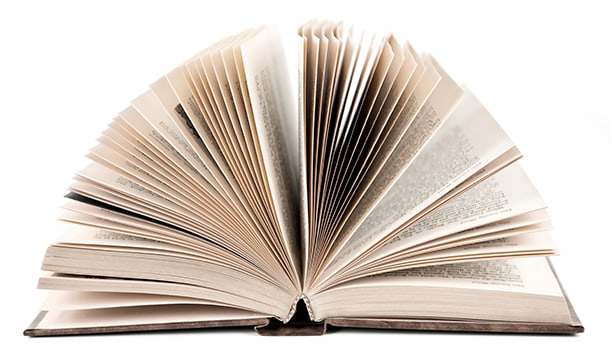 So, what I like about CDs is the huge variety of images ,papers etc, you can have. But…sometimes I find them a bit inflexible. It may be , however, that I just lack the skills to use them to their best advantage! 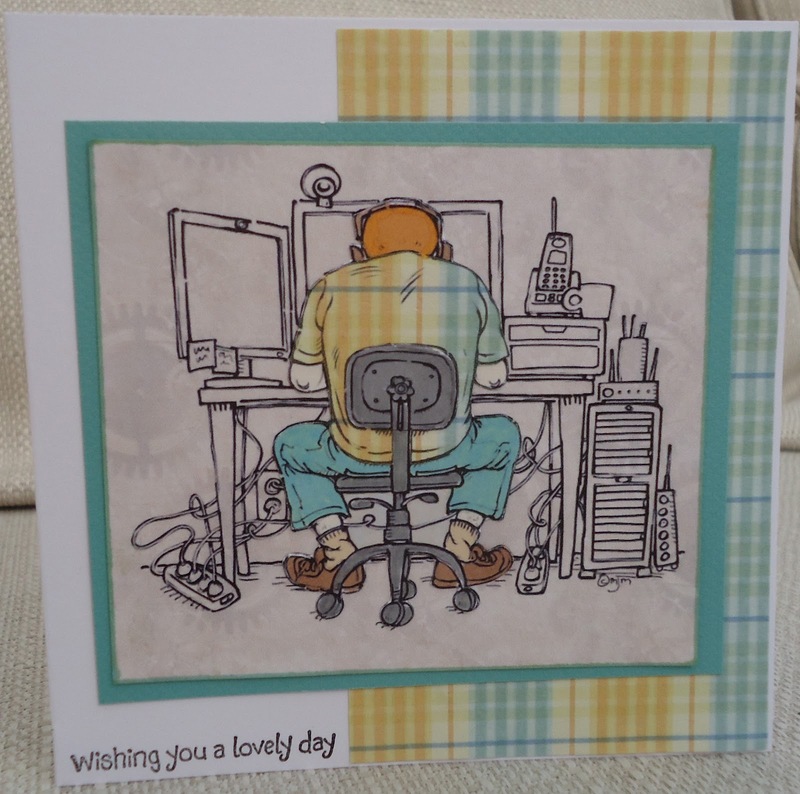 I recently ordered some digital stamps from Mo’s Digital Pencil. They have a great shop – I like the ethnic diversity of their characters and that they have images of girls in non-stereotypical activities. This image is called Dream G. I slightly digitally tinted the colour of the lines to a red-dy brown before printing. I coloured the image with various brands of alcohol markers. 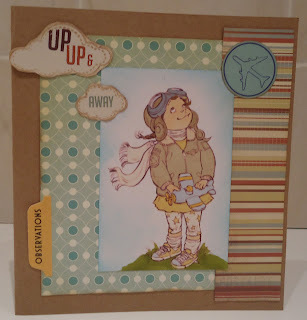 Kaisercraft Up, up and away rub on words and a scrap of striped paper. Cosmo Cricket Joy Ride scrap of turquoise paper. I've used this image a lot over the years - I think t's from a Woodware set. 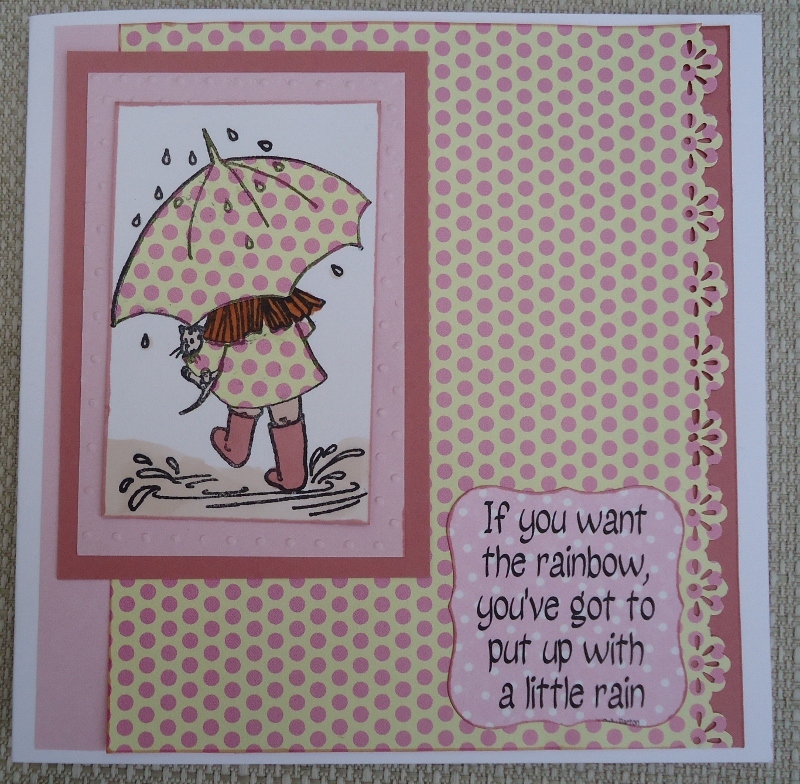 The quote is from Dolly Parton! A little (well, pizza-shaped) box was waiting for me when I got in from work today and one item in it was Bo Bunny lantern stamps. I stamped and masked the lanterns on a manila tag. 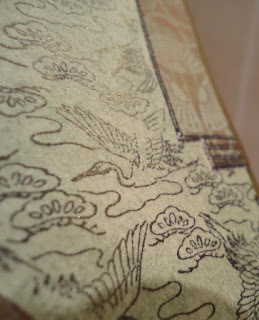 Then I stippled green Brilliance ink onto the tag and stamped with Judikins Heron stamp. I brushed a little gold Pearl-ex mica poweder over the top, although it's hard to see on the photo. I stamped the lanterns onto a patterned paper scrap and edged it all with Krylon. Then I added a metal brad and coin. This Easter, I’ve decided to resurrect an old technique I haven’t used for years – marbled backgrounds using Marvy Metallic Markers. I’m not sure if they even make these markers anymore. 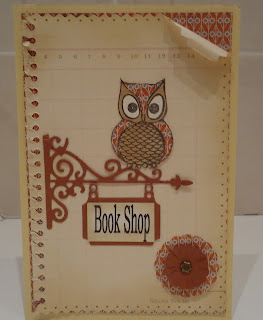 I sprayed water onto glossy card, added several colours of markers , more water and swirled them together. 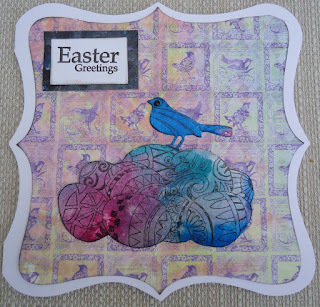 When dry, I stamped and embossed the eggs (Serendipity) and die cut the bird ( Marianne – I cut off the branch). I’m sure the bird is wondering where those massive eggs came from! 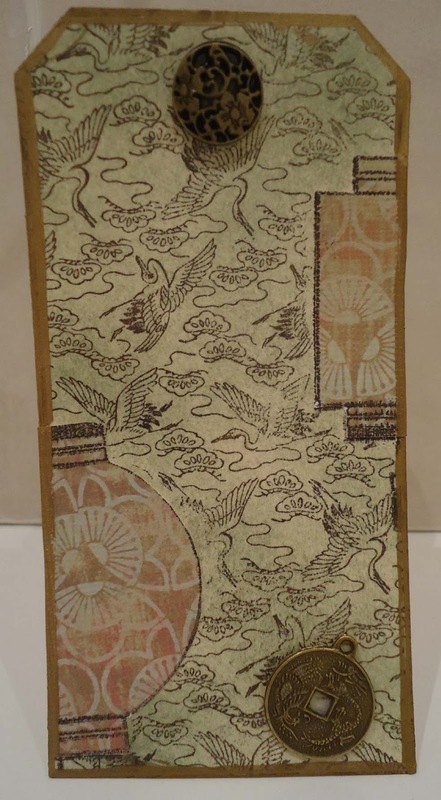 The background paper is by Crafty Individuals.